So much has happened, and is happening geopolitically, it makes the head spin. Where to begin. Ah, Syria. Yes, very important place both right now and in history as this is where Christ walked and preached with his disciples. No wonder Islamic radicals sponsored by nation states such as Saudi Arabia, Turkey, Qatar, UK, France, Germany and USA, Inc wanted it gone. They all have one thing in common--an unquenchable lust to serve the anti-Christ. What if things that are occurring now in full view of the public really are biblical in nature and scope, and no longer should any of us consider them just radical geopolitics, military conflicts or necessary harsh transitions in the financial system? Maybe God is rooting out all rebellious evil in the Middle East, West, East, Southeast Asia, New Zealand/Australia/Canada, Latin and South Americas… maybe He's cleaning up and we're being made witnesses to prophecy being fulfilled? Because if you look at everything occurring with eyes, you won't see banking, date and rate... you'll see the geopolitics and spiritual resolutions blending to create a new or restored universal order… and all in the name of Christ… including the Chinese Han Elders I might add. That might make for an entirely different currency redemption experience, huh? Different motivation because you're redeeming your own soul as sovereign pledge back to God and the spineless jellyfish of those who claim to be the creators of mankind and/or children of some off planet race? Such a perspective, while radical, brings with it a fresh rationale for taking say the sovereign rates over the screen rates. Saving your species and planet is kinda of a big deal. Thus, perhaps it's wise at this late juncture to put all possibilities on the table because it should be pretty obvious to all that we're collectively witnessing history being made of of epic proportions, as once thought insurmountable forces are being brought to their knees and quickly. Take Germania, the model of EU strength and discipline, who literally has no more Russian natural gas left in their pipes and cannot heat their nation's homes through the winter, as their EU allies Ukraine refuse to allow new gas supplies to a) be purchased and b0 pass through their pipelines. What to do for Mrs. Merkel? Resign perhaps before her March 2017 elections? Is this what we in the West are waiting on? Or are we just waiting on Ukraine to accept and implement the Minsk Agreement and change out their government and currency? Or both? There's also a desperate energy vortex hijack attempt going on now in Palmyra, which is where the Islamic state has decided to make a Butch Cassidy / Sundance Kid-esque stand in an effort to restock their evil energy supply, which is being savagely reduced by 24/7/365 hunting ghost squads of special forces from our US Republic, Iran and Russia. These "special unites" don't mess around and don't ask questions. They find bad guys, they kill the bad guys, and they leave. That's sadly where we are in terms of diplomacy. Those who persist in anti-Christ type efforts are just being annihilated off the planet. As the God or not God choice is real… and that goes for all of us I might add, not just warriors fighting armed battles on behalf of good and evil. Judgement is here. And surrender and continued rebellion are your only two choices. President Assad of Syria has been a beacon of strength and shelter for the Orthodox Christian communities of the Middle East, and why he is so hated by Israel and the entire radical Muslim caliphate. Christ is not their savior. Yet they exist here with so many Christians, and occupy their Holy Land. Not vice versa. Palestine will return to pre-1947 boundaries and there's nothing Israel or Khazarian Empire royal families can do about it. This is why the changing of the guard at the UN this week was such a big deal, and why its new president mentioned Israel/Palestine relations in his remarks. So basically, what we are witnessing less all the banks and call centers right at this moment prepping for a pre-Christmas revaluation of currencies and historic bond gift at anytime, is the the final spiritual war to conclude just as it was predicted in multiple religious texts. And whether you believe this post, understand this post, have studied the topics contained in this post or simply don't agree with nor care about the contents discussed in this post--this is what is going on in your world--and all must either adapt or die in the new era of light. Heaven is retaking the earth and reclaiming all who have sincerely sworn their soul allegiance back to the light of God, and way from the hellfire warriors who have exercised sinful acts beyond understanding for a dozen plus millennia; and even claimed control of the earth and all its riches, as well as God's sacred species Hu-manity just because we are physical stewards for a slice of His Divine Oversoul--what a rare blessing in all the cosmos this is no question. Wow! Don't blink or you'll miss the world changing hands! They went ahead and cut a deal with Turkey. Man that's harsh. That's the coldest cold shoulder you can do in diplomatic circles. But who even noticed? Of course not most to all... it's just the fate of the world. Go back to sleep America. Well wake you up when it's all done and give you 800 numbers for the nearest redemption center. Too funny. Harvesting the crop, without learning the lesson, which means you are sure to lose it eventually. I guess there's really a time and place for everything under the sun. The cabal's time has come and gone and our time is just now. Sobeit. An end to the silent gas supply crisis in Europe appears to be close. Russia has vowed to restore full services once EU observers are in place to check flows moving through Ukraine pipelines. Diplomats in Prague said the European Union would send monitors to Ukraine today, to be deployed at the main metering stations for gas arriving from Russia. The Czech EU presidency said the monitors agreement 'should lead to the Russian supplies of gas to EU member states being restored. Czech officials, however, declined to give any details of the deal. The apparent breakthrough came after a phone conversation yesterday between German Chancellor Angela Merkel and Russian Prime Minister Vladimir Putin. Nevertheless, Russia and Ukraine have yet to agree on a price for Russian gas deliveries. Yesterday Mr Putin again demanded that Kiev pay the going market rate up front. Russia's state-controlled gas company Gazprom has accused Ukraine's Naftogaz in the past of siphoning off supplies and refusing to pay its gas supply bills. Ukraine denies these accusations and says it did not deserve to have the gas tap turned off, which Russia secretly did last week. About 80 per cent of EU-bound gas from Russia comes via Ukraine, prompting concerns for fuel supplies across member states. Gazprom chief executive Alexei Miller, speaking after talks with European Union officials in Brussels, also said he would hold further face-to-face talks with Ukraine's Naftogaz on a flight back to Moscow to try to restore supplies to Europe. 'This must be resolved today,' Miller told reporters. Earlier yesterday Russia and Ukraine failed to reach agreement over the gas dispute which has left 12 European countries without power, 18 affected in all. Despite the EU giving company bosses at the centre of the crisis just 24-hours to restore supplies, talks quickly stalled. As 18 European countries reported cuts to supplies, the leaders of both Russia and Ukraine were warned to stop treating Europe's gas supply as a 'hostage', as millions of people struggled to cope in sub-zero temperatures, it has emerged that gas prices could also soar in Britain if there is not a swift resolution to the crisis. Moscow has slowly pulled the plug on three major pipelines after a pricing dispute with Ukraine. Supplies have dwindled throughout this week and today Austria, Slovakia and the Czech Republic confirmed their pipelines were empty. 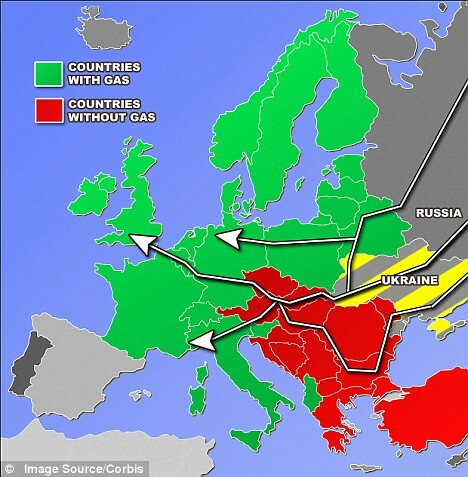 With Bosnia, Bulgaria, Croatia, Greece, Hungary, Macedonia, Romania, Serbia and Turkey already out of gas. Italy suffered a 90 per cent plunge, France was down 70 per cent and Germany 65%. Britain, however, is unlikely to run out of gas as only two per cent of supplies come from Russia which can be replaced from other sources if necessary. There is little sign of resolution to the row with Moscow and Kiev both blaming each other for cutting supply. Russia has accused Ukraine of 'stealing' about 15 per cent of the gas it ships across its former Soviet neighbor to European states. 'Ukraine has stolen gas not from Russia, but from consumers who have bought the product and paid for it,' Prime Minister Vladimir Putin said. The Han dynasty (Chinese: 漢朝; pinyin: Hàn cháo) was the second imperial dynasty of China (206 BC–220 AD), preceded by the Qin dynasty (221–206 BC) and succeeded by the Three Kingdoms period (220–280 AD). Spanning over four centuries, the Han period is considered a golden age in Chinese history. To this day, China's majority ethnic grouprefers to itself as the "Han people" and the Chinese script is referred to as "Han characters". It was founded by the rebel leader Liu Bang, known posthumously as Emperor Gaozu of Han, and briefly interrupted by the Xin dynasty (9–23 AD) of the former regent Wang Mang. This interregnum separates the Han dynasty into two periods: the Western Han or Former Han (206 BC – 9 AD) and the Eastern Han or Later Han (25–220 AD). The Han dynasty was an age of economic prosperityand saw a significant growth of the money economyfirst established during the Zhou dynasty (c. 1050–256 BC). The coinage issued by the central government mint in 119 BC remained the standard coinage of China until the Tang dynasty (618–907 AD). The period saw a number of limited institutional innovations. To pay for its military campaigns and the settlement of newly conquered frontier territories, the government nationalized the private salt and iron industries in 117 BC, but these government monopolies were repealed during the Eastern Han period. Science and technology during the Han period saw significant advances, including papermaking, the nautical steering rudder, the use of negative numbers in mathematics, the raised-relief map, the hydraulic-powered armillary sphere for astronomy, and a seismometer employing an inverted pendulum. The Xiongnu, a nomadic steppe confederation,defeated the Han in 200 BC and forced the Han to submit as a de facto inferior partner, but continued their raids on the Han borders. Emperor Wu of Han(r. 141–87 BC) launched several military campaignsagainst them. The ultimate Han victory in these wars eventually forced the Xiongnu to accept vassal status as Han tributaries. These campaigns expanded Han sovereignty into the Tarim Basin of Central Asia, divided the Xiongnu into two separate confederations, and helped establish the vast trade network known as the Silk Road, which reached as far as the Mediterranean world. The territories north of Han's borders were quickly overrun by the nomadic Xianbei confederation. Emperor Wu also launched successful military expeditions in the south, annexing Nanyue in 111 BC and Dian in 109 BC, and in the Korean Peninsula where the Xuantu and Lelang Commanderies were established in 108 BC. After 92 AD, the palace eunuchs increasingly involved themselves in court politics, engaging in violent power struggles between the various consort clansof the empresses and empresses dowager, causing the Han's ultimate downfall. Imperial authority was also seriously challenged by large Daoist religious societies which instigated the Yellow Turban Rebellion and the Five Pecks of Rice Rebellion. Following the death of Emperor Ling (r. 168–189 AD), the palace eunuchs suffered wholesale massacre by military officers, allowing members of the aristocracy and military governors to become warlords and divide the empire. When Cao Pi, King of Wei, usurped the throne from Emperor Xian, the Han dynasty ceased to exist. A humanist, a listener, António Guterres, ex-Prime Minister of Portugal, ex-Director of UNHCR, the UN High Commissioner for Refugees, ex-President of International Socialist, was sworn in as United Nations Secretary-General this afternoon, over the UN Charter. A new chapter in world history is due to begin with a hands-on, people person in charge. The United Nations gains more than a breath of fresh air with the appointment of the Portuguese ex-Prime Minister and ex-UNHCR Director, António Guterres, as the next Secretary-General. The UN gets a free thinker, a man of integrity and courage, someone who is more than an apparatchik, someone who can make a difference, a people person. António Guterres fought his winning election campaign to lead his Socialist Party to victory after ten years of governance by the PSD, or Social Democrats, under the then PM Aníbal Silva, had led the country to breaking point, with the expression "The Portuguese are not a business. They are people". That expression sums up António Guterres.